Organizations can engage in specific actions to fully integrate reframing into overall communications and maintain consistent reframing into the future, which results in sustainable implementation. Ensuring that reframing is integrated into your overall communications means weaving the approach into the fabric of your organization, making it automatic and easier to adopt for staff already strapped for time. Sustainability is achieved when reframing is established as the lens through which to make communications, development, and policy decisions across the organization. As a result of standardizing approaches and policies, organizations will be able to save time and effort by not having to continually reinvent the wheel or lose momentum due to staff turnover. Identify and catalogue the internal processes your organization uses to make strategic decisions about communications, development, and public policy, and ensure the people who are part of those processes are familiar with reframing. Below are tips and examples of how an organization can successfully institutionalize reframing throughout certain strategies and content. 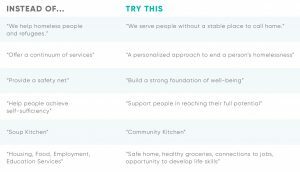 Caritas of Austin’s “Instead of… Try This” Messaging suggestions, which provide concrete examples of translating old messages into reframed ones. Organizations often develop and codify internal processes to ensure that decisions and communications are consistent. Common examples include communications and fundraising plans, and guidelines for determining if and how to take a position on a public policy issue. Embedding reframing into these processes will make it more likely that the resulting advocacy and external communications achieve the benefits of reframing. Similarly, organizations may create broader and more big-picture internal strategy documents that incorporate their mission and/or vision, priorities, and decision-making process so that ongoing efforts and decisions are aligned with the organization’s broader objectives. These products are generally living documents that can be adapted as needed by serving for a set period of time, such as three to five years. 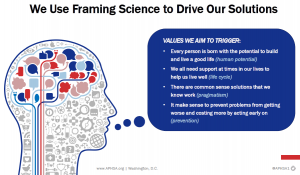 The Building Well-Being Narrative can be woven throughout the various levels and components, but you can also be more explicit in using framing science to accomplish the organization’s goals. Our longtime reframing partners, American Public Human Services Association (APHSA), recently updated their Strategic Playbook for 2018-2022. It excels in applying the Building Well-Being Narrative and general framing strategies throughout their foundational statements. Moreover, they specified effective framing itself as a strategy and the reasoning behind their choice of language. See our review of the Playbook and its application of reframing. Like all communications efforts, reframing requires resources, including staff time and costs associated with developing websites, brochures, advertisements, and other communications pieces. You can minimize the costs by weaving reframing into your existing communications plan and pacing out implementation over time. If you are concerned about having the staff capacity and resources necessary to truly advance reframing, consider seeking relevant funding on the organization, coalition, or community level. For example, some community foundations have funded reframing trainings and technical assistance for their grantees. Funders who view marketing and communications as essential functions of an organization may also be open to supporting efforts to bring communications into alignment with the research-based reframing recommendations. MODULE 2: Learn how to do a thorough review and revision of organizational communications and materials once your organization is on board with Reframing. MODULE 4: Learn how to understand and capitalize on the power and efficiencies of coalitions for advocacy objectives with reframing and achieve the benefits of formal collaboration. Don't miss out on the latest Reframing news! Sign up for our network newsletter, specifically for the Reframing Human Services Initiative to stay informed about program updates, implementation tips, best practice guides, practical advice, new publications, and more. Are you interested in becoming part of the only network of national nonprofit human service organizations to be a part of the collective voice of the sector? Find out more about membership with the National Assembly and all of the benefits that come with.